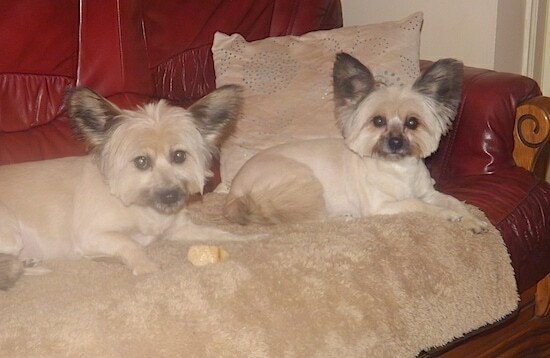 Shtiya and Tikanni the Skye-Paps at 5 years old—"Their mum is Skye Terrier and dad is a Papillon. Both parents and grandparents were show dogs. A couple were splitting up and my friend took the Skye Terrier, then discovered she was pregnant. I chose my puppies when they were 4 and a half weeks old. They are super smart, beautiful dogs. Their coats have to be groomed regularly as it's like cotton wool underneath and goes into knots when they get wet! In my retirement they are a great comfort and the most loving dogs I've ever known." The Skye-Pap is not a purebred dog. It is a cross between the Papillon and the Skye Terrier. The best way to determine the temperament of a mixed breed is to look up all breeds in the cross and know you can get any combination of any of the characteristics found in either breed. Not all of these designer hybrid dogs being bred are 50% purebred to 50% purebred. It is very common for breeders to breed multi-generation crosses.